Pimples are also known as acne and it is a skin disease in which the oil glands become more active and secrete excessive oil. Pimples are mostly seen during puberty and oil glands become very active due to hormonal changes. Acne is not a serious problem but in some individual it may leave scars. There are oil glands present under the skin. The oil glands produce sebum which removes the dead skin cells from the surface of the skin. A small hair follicle may grow out from the skin and when this hair follicle gets blocked, it may cause accumulation of sebum under the skin thus producing pimple or acne. Acne may appear on other parts of the body as well such as head, chest, back and shoulders. It is estimated that people get acne from the age of 11 -30 years. It may occur in people of all races. Young adults and adolescents are more commonly affected by pimples. The most important cause of acne is the imbalance of hormones. Androgen or testosterone is believed to be the cause of pimples. The levels of testosterone rises which enhances the growth of oil glands present under the skin. Oil glands start producing more oil that leads to the growth of bacteria and development of pimples. 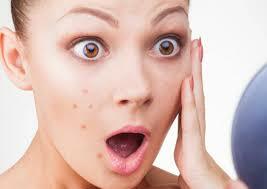 It is also found that acne could also develop due to genetic factors. Acne may occur in the individuals of same family. Some individuals may have genetic predisposition for the increased level of androgen hormone that may cause acne. Increased use of cosmetics and other facial treatments can also cause acne. Many cosmetics contain harmful chemical agents that may harm the skin adversely and can produce acne. In women, acne can also occur during pregnancy. Hormonal changes take place during pregnancy which may result in the formation of pimples. Acne may become worse during menstrual cycle. Hormonal changes take place in girls and women during menstrual periods that may aggravate acne. Mental stress is another important cause that may aggravate the acne or pimples. Stress hormones are responsible for producing acne in many people. Climatic conditions such as hot and humid climate can make the pimples worse. Acne may also get worse if anyone tries to squeeze the pus. Girls who apply oil based cosmetics and use excessive make up can also suffer from acne. Divya Kayakalp vati: This is the most important herbal remedy used for the treatment of any type of skin disease. It gives glow to the skin and prevents the excessive secretion of sebum from the oil glands. This herbal medicine for pimples helps to give clean and fair skin. It also prevents the formation of scars and also helps to improve the complexion. 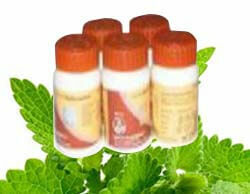 It is a very useful remedy for the treatment of acne and other skin diseases. It may regularly be taken to purify the blood and to remove the acne and scars from the skin. Patanjali Nimb Ghan Vati: It is a womderful herbal remedy for skin problems. It contains the natural extracts of neem tree. Neem is known for its beneficial results in curing the skin problems. Neem is known for its anti-bacterial and anti-inflammatory properties. Patanjali Nimb Ghan vati helps to get rid of pimples and its scars naturally. It is a unique natural solution for preventing the reoccurance of acne and pimples. It brings a natural glow on your skin and helps to rejuvenate your skin naturally. Divya Kanti Lep: This is a wonderful herbal and natural remedy for the treatment of acne. It is a natural cure for pimples. This herbal medicine for pimples may be used regularly to get clean skin. It removes all the scars from the skin and it also prevents recurrent occurrence of acne and pimples on the skin. This remedy helps to boost up the immunity and prevents the formation of acne. It helps in balancing the hormones to control acne in young individuals. Apply ice cubes on the affected part of the skin. Ice helps in reducing the amount of oil on the skin and gives you relief from acne. Add one tea spoon of cinnamon powder and one tea spoon of lemon juice to make a paste. Apply this paste on the affected areas of the skin to get quick relief from pimples. You can also use honey to get rid of pimples. Take a cotton swab and dip in honey and apply it on the affected skin areas. Keep it for half an hour and then wash with Luke warm water to get clean and clear skin. Garlic is also useful for the treatment of acne at home. Garlic is known for its anti-inflammatory properties. You may cut garlic in two pieces and rub it on the affected skin. Keep it for some time and then wash your face with Luke warm water. You can do this several times in a day for getting quick relief from pimples. Take orange peels and dry them in the sun. After drying them properly, grind them in a mixture. Add few drops of water to the powder of orange peels and apply it all over the face like a face pack. It not only improves the texture of your skin but also removes pimples from your skin quickly. Take dried neem leaves and grind them to make powder. Add half tea spoon of turmeric powder to half tea spoon of neem leaves powder and make a paste by adding water. Apply this paste on the face and keep it for 15 minutes and then wash off to get clean and healthy skin. Prepare a mixture by adding equal amounts of rose water and glycerine and apply it on the face. Leave it for ten minutes and wash off to get acne free skin. Avoid eating fried foods and chocolates. These can aggravate the pimples on your skin. Drink more water as water is a natural body cleanser and helps to remove the harmful chemicals out of the blood. Eat more fruits and vegetables that contain vitamins and minerals. Fruits and vegetable provide necessary nutrition to the skin cells and prevent skin diseases such as pimples.